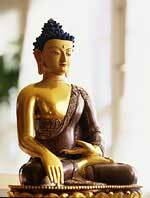 The historical Buddha Shakyamuni was born around 560 B.C.E. to a royal family. From early childhood, he was surrounded by wealth and beauty, and enjoyed a sophisticated education. The texts describe him as tall, strong, and blue-eyed. When he was 29 years old, he left the palace for the first time and encountered an old person, a sick person, and a dead person, experiences he had never known before. He then realized that nothing was permanent and left his palace to meditate in the mountains and forests of Northern India. After a long search for lasting meaning, he recognized the nature of mind while in deep meditation and reached enlightenment. The Buddha's teachings, which make beings fearless, joyful, and kind, are the main religion in several East Asian countries. Since the early seventies, the profound Buddhist view with its vast number of methods has inspired and fascinated a growing number of people in Western cultures. Buddha teaches about ultimate and conditioned existence in a way that makes Buddhism directly relevant to our daily lives. Understanding this makes the experience of lasting happiness possible. Buddhism does not proclaim dogmas; rather, it encourages critical questioning. Using the right meditations, the intellectual understanding of the teachings becomes a personal experience. Additional methods solidify what is reached in meditation. 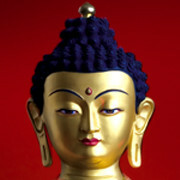 The goal of Buddha's teachings is the full development of the innate potential of body, speech, and mind. Through his teachings, Buddha is seen as a timeless mirror of mind's inherent potential. In the process of becoming liberated, one first discovers that body, thoughts, and feelings are in a constant state of change. Therefore, there is no basis for a real existing ego or "self". Realizing this, one no longer feels like a target and stops taking suffering personally. Enlightenment is the second and ultimate step. Here, the clear light of mind radiates through every experience. In every moment, mind enjoys its self-arisen abilities and everything becomes spontaneous and effortless.